After researching copious mac & cheese recipes, I decided to pick all of the ingredients out from other recipes that I thought would make one good, baked mac. 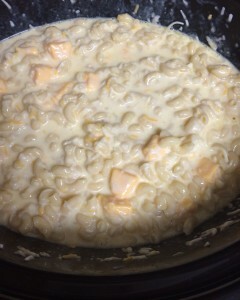 In the end, I created my own crock pot recipe for baked mac & cheese. 1. Boil water for the pasta. Cook the pasta, al Dente, and drain (about 4 minutes so the pasta is cooked but firm). 2. 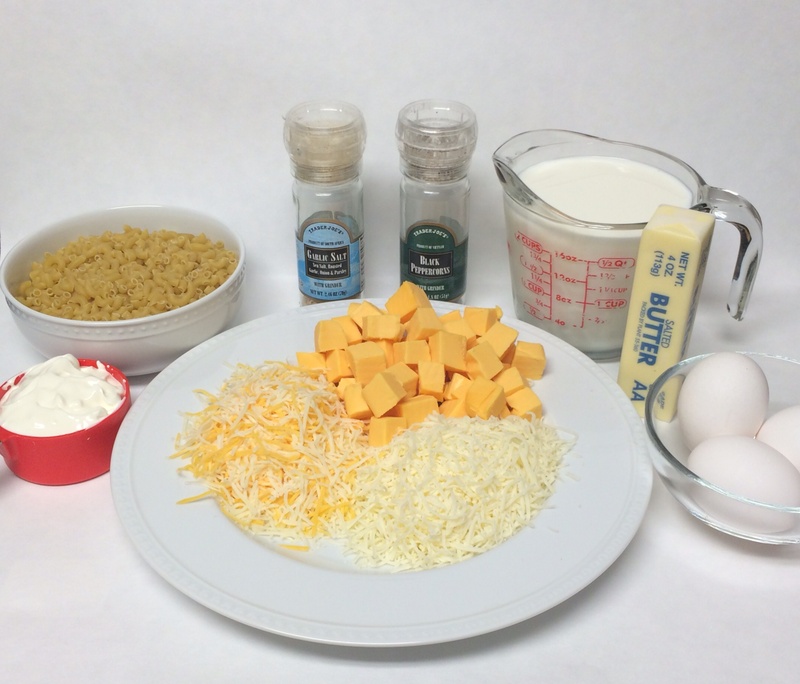 Melt butter in a bowl and whisk the 3 eggs in another bowl. 3. 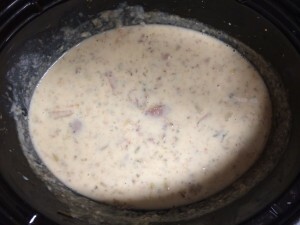 Place pasta in large crockpot. Add the whisked eggs, melted butter, sour cream, milk, and cheeses; and stir well. 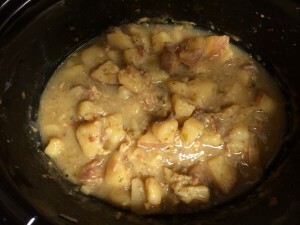 Stir occasionally while cooking on low for 2 to 3 hours in the slow cooker. 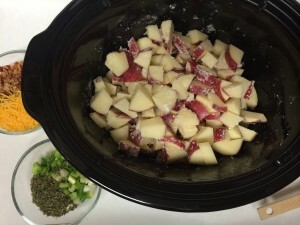 PHOTO: when all ingredients are first placed in crock pot. Mac & Cheese is my absolute fav, no joke!! Sooo cheeesy, sooo easy, soooo delicious!! I even have a clutch that says, “You can not convince me that mac and cheese is not a vegetable!” Oh, how I wish it were!! 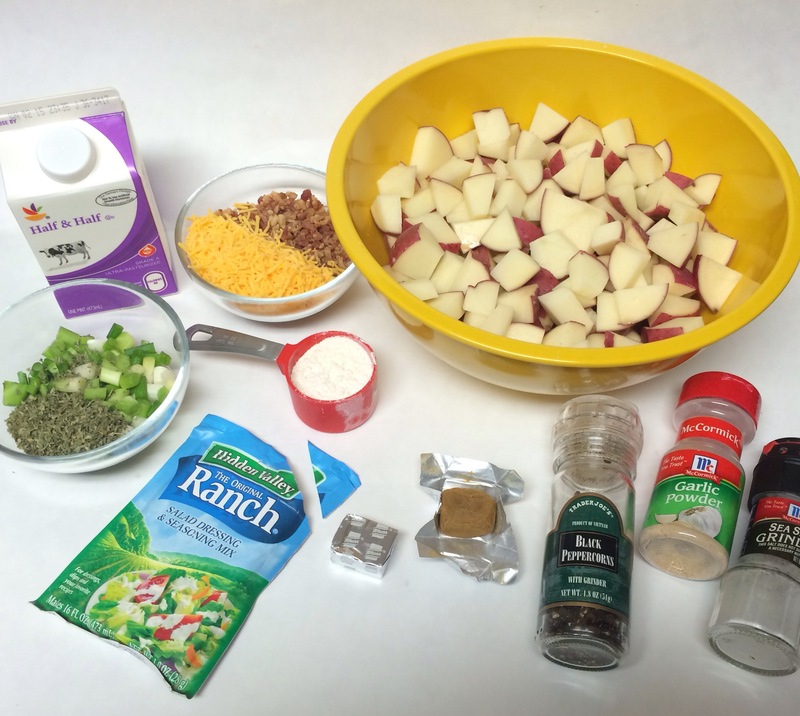 I looked at about 20 different baked mac and cheese recipe before deciding on these ingredients. I opted to use more whole milk instead of any condensed milk because I did not want it to have any sweet taste. 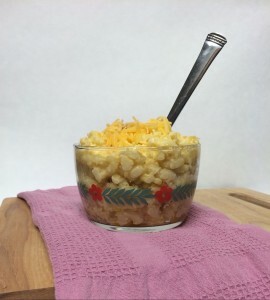 Using 3 eggs it was makes it stick together some, I would highly recommend using eggs in baked mac and cheese. Last thing, this does make a very large portion, it would be great for a party or holiday gathering. This is one left over I can definitely do!! Have a safe and Happy Thanksgiving!! I am thankful for Mac & Cheese!! 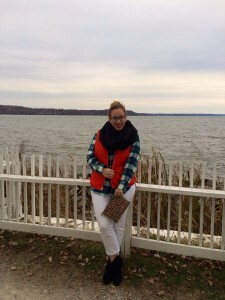 Even though the weather may feel like winter, it is still fall, which means this basic girl is still trying to get in all the pumpkin recipes she can! 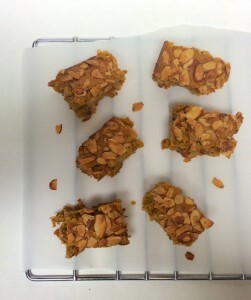 These pumpkin almond bars are perfect for breakfast, snack, or dessert and go great with a hot cup of joe! 1. Preheat oven to 350 degrees and grease a 9 inch square baking dish. 2. In a mixing a bowl, stir butter and sugar until there are no lumps. Stir in egg, vanilla, and pumpkin. 3. 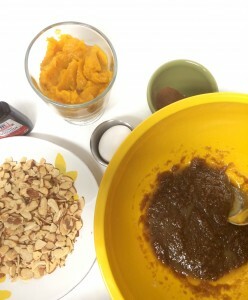 Add flour, cinnamon, baking powder, pumpkin spice, salt, and nutmeg. 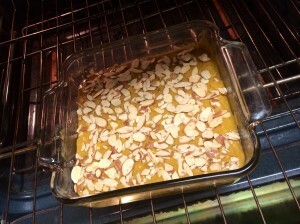 Fold in half of the almonds and spoon the mixture into the baking dish. 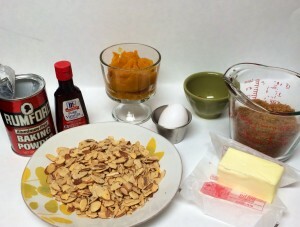 Sprinkle the remaining almonds on top. 4. Bake for 40 minutes. Let the dish cool before cutting the mixture into bars. Place pumpkin almond bars on parchment paper to cool. 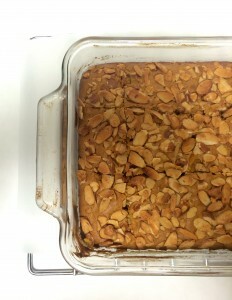 I brought these pumpkin almond bars to some friend’s house for a dinner party! 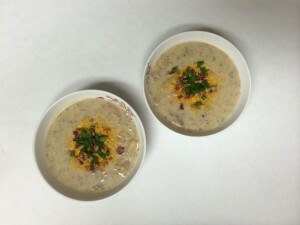 It was the first time I made them, but everyone seemed to enjoy them! They were described as fall in your mouth, sounds like a good Thanksgiving-time treat!! They are quite versatile, if you ask me, can be an on-the-go breakfast and snack, or the perfect little after dinner sweet. 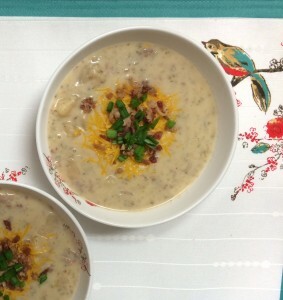 This recipe came from the Better Homes and Gardens magazine; I changed a few ingredients to better suit my taste. My husband and I are hosting our first Thanksgiving as husband and wife! My husband’s side of our family is traveling from down south to spend the holiday with us, which makes name tags for the table a must! I am very anxious to host my first holiday! It will be the first turkey that I am cooking on my own; as well as making the side dishes and desserts! And by on my own, I really mean with some help from Jason. Now I will surely appreciate (even more) all the hard work that my mother puts in to each holiday, every year. 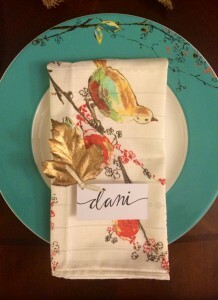 This DIY is pretty self-explanatory, yet it will make a classy touch to any Thanksgiving table. 1. 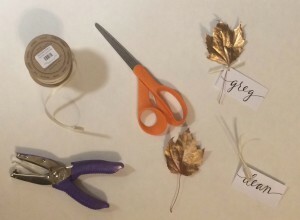 Collect pretty leaves (or leafs, both ways are accepted). I recommend finding flat leaves that have long stems. 2. 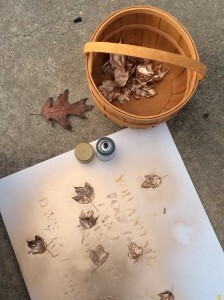 Place your leaves on poster board or grocery bags that you do not mind getting messy. Spray paint your leaves by holding the spray paint a few feet away. 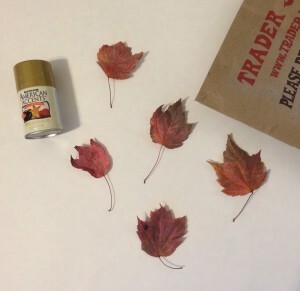 Let them dry for about 2 hours before moving the leaves. Leaves are delicate, so be sure to handle them with care! 3. Write the names of your Thanksgiving guests on card stock. Put a hole-punch in the top left corner. 4. String a small piece of ribbon through the hole on the card stock. 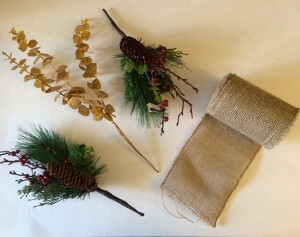 Just before you tie the knot, gently slide the stem of the leaf through the hole of the knot. The weather has dropped, which means it time to break out the warm flannel. 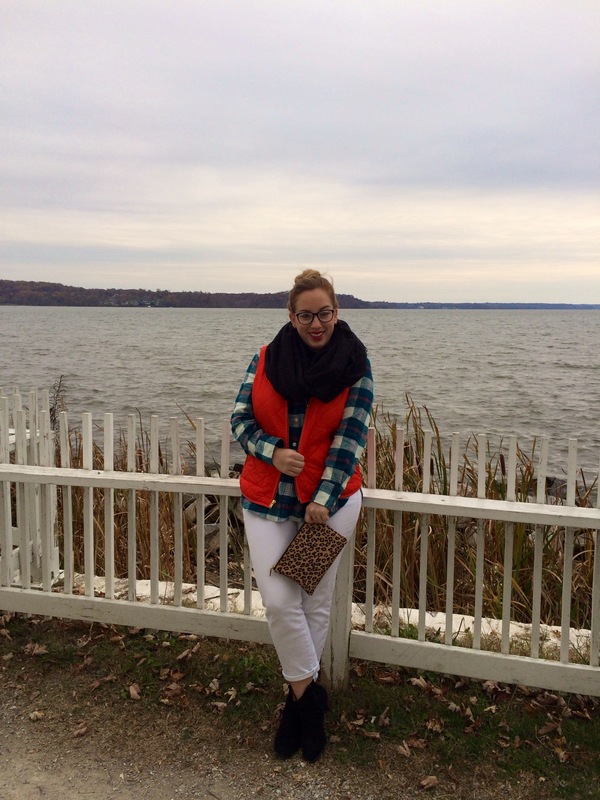 I could live everyday in this boyfriend flannel from my fav store! 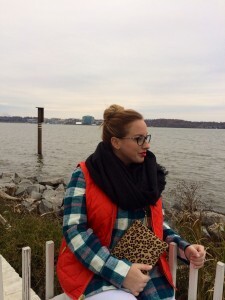 This girl is tartan obsessed; I would like this bluegrass tartan print in a pair of pajamas, a blanket, a throw pillow.. please and thank you!! Read about what historic landmark these photos were taken out at too!! 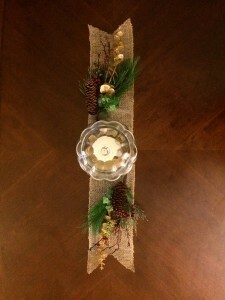 I wanted to make a centerpiece that would be versatile for both Thanksgiving and Christmas since the two holidays are not even one month apart. I went for a natural or rustic look with a little bit of sparkle! I have to have something in the center of my table or it just looks too plain, to me. In the summer I usually just have a vase with fresh blooms on the table, but for the fall and winter holidays, I like to have a little something more! This year, Thanksgiving and Christmas are only 28 days apart. I wanted to make a quick, affordable, and versatile centerpiece that I could keep up for the end of autumn and the start of winter. My husband and I are hosting Thanksgiving at our house in VA; my husband’s family (my family now too!) are coming from FL, SC, and GA. Jason and I will be traveling to FL in December to spend Christmas with our families. Even if rustic is not your style, I hope this DIY post conveys how quick you can throw an inexpensive centerpiece together that will look great through the winter season!